Can I add folders to the dock? I know that some docks support folders. Does Plank? If so, how can I add them? Yes, Plank support folders for both apps and filesystem locations. Find the path/folder you want to create a shortcut to in Files. Drag the folder to Plank. 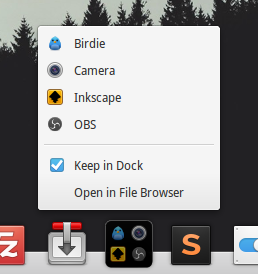 You can use Gnome-Pie as an alternative to grouping applications in the dock. Plank - How i can add on dock a folder like home/fred/mymusic? Is it possible to get website shortcuts in the dock? How to change icon folder in Plank? Can I run multiple instances of plank with separate settings? How can I change the “stack” (folder) icon in the dock? How to add Firefox to Dock? How to add PlayOnLinux's app shortcut to Plank?